In this short Windows Phone tutorial, I want to show how Windows Phone users can record their mobile phone's screen and save as a movie clip. Actually, what Windows Phone users like me (I'm a Nokia 920 user) can do is to download Project My Screen App for Windows Phone application and install it on their Windows OS running PC. Then after connecting their Windows Phone and PC via a cable, Windows Phone users can run Project My Screen App for Windows Phone application which enables them to reflect all movements on their Windows Phone to Windows PC screen. After connection is setup and Project My Screen application is running, by using a screen recorder program like FastStone Capture software, they can save all action taking place on their Windows Phone screen in a movie format. Let's review each step once more. Download Project My Screen App for Windows Phone software from Microsoft Downloads portal. After download is completed, run setup wizard by launching ProjectMyScreenApp.msi and install the application. After installation is completed successfully, connect your Windows Phone device and Windows OS device using a USB cable. 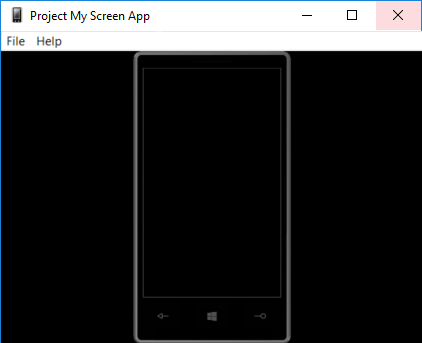 Run Project My Screen App for Windows Phone application. At this time on your Windows Phone screen, enable projection of your Windows Phone's screen to your computer by giving approval to the displayed message. Start your favorite screen recorder software on your Windows PC and start capturing Windows Phone screen. Please check Windows Phone screen recording sample here.